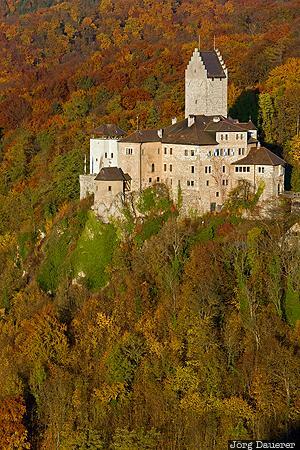 The old castle of Kipfenberg surrounded by colorful autumn foliage illuminated by warm evening light. Kipfenberg is in Upper Bavaria (Oberbayern) in the south of Bavaria, Germany. This photo was taken in the afternoon of a sunny day in October of 2015. This photo was taken with a digital camera.